This MP3 player is definitely for the extremely dedicated Star Wars fans. There are those that just watch the movies and can throw out the occasional quote. Then there’s the other bunch that can quote over half of most of the movies and has at the very least gone someplace with a toy lightsaber attached to their hip. That is, if not going in full storm trooper gear or in any other Star Wars costume. 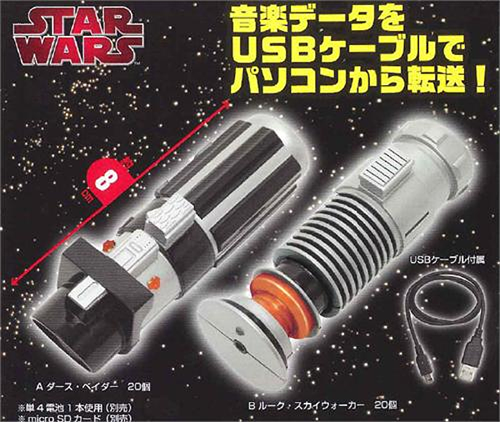 Well for those that live and breathe Star Wars now you can own a lightsaber MP3 player. A couple of years back there were rumors of such a device existing, but it could never actually be confirmed. Now there is a company offering these MP3 players in two different forms. They aren’t out just yet, they’ll be released sometime in February of this year. It measures 3.14 inches in length and has a microSD memory card slot. There is no LCD screen, so the songs will just be played in the order that they’re stored on the memory card. You can purchase one of your own for $23.90 from NCSX.